Many manicure procedures can increase the risk of fungal infection. FUNGICURE Manicure & Pedicure Liquid Gel is a maximum strength topical anti-fungal, specifically formulated for those with manicured, pedicured or artificial nails. Artificial nails and nail tips require vigilant care because they can often trap water, which can lead to fungal infections. FUNGICURE Manicure & Pedicure Liquid Gel kills ugly fungus for healthy looking fingers and toes using clotrimazole, an anti-fungal medicine that eliminates six types of exposed fungus. It's specially formulated for those who get manicures or pedicures or use artificial nails. The precision QuickBrush™ applicator allows you to easily apply the powerful Liquid Gel to inhibit the growth and reproduction of fungal cells on cuticles, around nail edges and under nail tips. The formula is remarkably light and dries quickly, so it won’t interfere with manicure or pedicure procedures. What is the active ingredient in FUNGICURE Manicure & Pedicure Liquid Gel? FUNGICURE Manicure & Pedicure Liquid Gel contains 1% Clotrimazole as the active ingredient. What are the directions for FUNGICURE Manicure & Pedicure Liquid Gel? The directions for FUNGICURE Manicure & Pedicure Liquid Gel are to first clean the affected area with soap and warm water and dry thoroughly. Then apply a thin layer over the affected area twice daily (morning and night), or as directed by a doctor. For athlete’s foot and ringworm, use daily for 4 weeks. If condition persists longer consult a doctor. Be sure to read all Directions, Uses, and Warnings and follow them carefully. I have a fungal infection on my nail. Can I use FUNGICURE Manicure & Pedicure Liquid Gel? FUNGICURE Manicure & Pedicure Liquid Gel helps eliminate fungal infections on the skin around and adjacent to the nail and on skin under the nail where normally accessible with the Quickbrush Applicator. 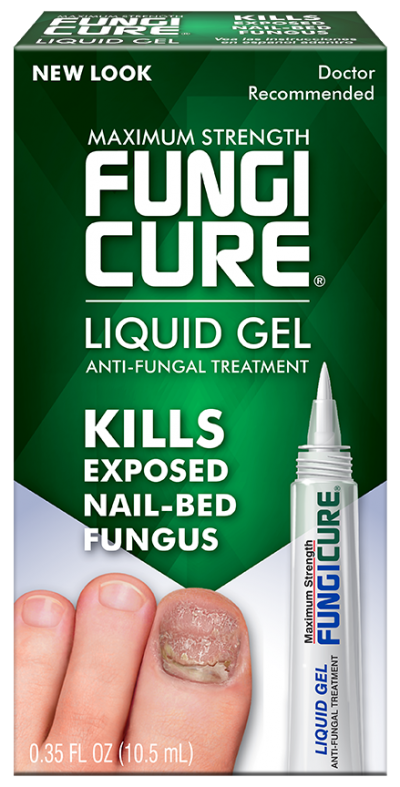 FUNGICURE Manicure & Pedicure Liquid Gel will not be effective against infections in or under intact nails because it will not penetrate hard intact nail surfaces. However, if nails are missing, cracked, broken or partially separated from the nail bed, FUNGICURE can reach and kill the fungus by direct application or related capillary action (the ability of liquids to travel through narrow spaces due to surface tension). 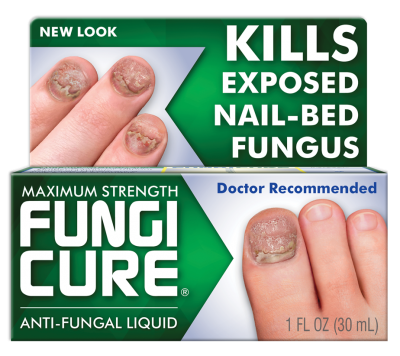 Can I use FUNGICURE Manicure & Pedicure Liquid Gel to prevent a fungal infection? No. FUNGICURE Manicure & Pedicure Liquid Gel is not labeled for the prevention of fungal infections. When should I expect to see improvement? You can expect to see improvement within 4 weeks. If you are seeing improvement, you may continue to use FUNGICURE until your fungal infection resolves or clears. If you do not see improvement within 4 weeks, you should stop use and consult your doctor. What kind of improvement should I see? When FUNGICURE is able to reach and kill the fungus by direct application or related capillary action (the ability of liquids to travel through narrow spaces due to surface tension), you should notice natural regrowth of healthy looking tissue. How is FUNGICURE Manicure & Pedicure Liquid Gel different than FUNGICURE Manicure & Pedicure? FUNGICURE Manicure & Pedicure Liquid Gel comes in a convenient, compact QuickBrush™ applicator. It is also in the form of a slightly thicker liquid gel formula. Maintaining the appearance of your manicure and pedicure requires more than cosmetics. Many manicure procedures can enhance the risk of fungal infection, and certain types of artificial nails can trap moisture and fungi and create a perfect environment for fungus to grow and spread. Cutting cuticles can also create opportunities for fungal infections. When you promptly treat fungal infections on cuticles and nearby skin surfaces, you reduce the risk of the infections spreading. FUNGICURE Manicure & Pedicure Liquid Gel is a maximum strength anti-fungal, specifically formulated for those with professionally or home-manicured, pedicured or artificial nails. FUNGICURE’s precision QuickBrush™ applicator allows for easy application on hard to reach infections, including under nail tips. Maximum Strength FUNGICURE Manicure & Pedicure Liquid Gel contains clotrimazole, an anti-fungal medicine that has been proven effective against 6 types of fungi such as E. floccosum, T. mentagrophytes, M. canis, M. gypseum, T. tonsurans and T. rubrum. When applied as directed, FUNGICURE Liquid Gel acts promptly to target, destroy and prevent the spread of infection by inhibiting the growth and reproduction of fungal cells.